With respect to web design, the result of team collaboration is almost always a better product. There are very few projects that can be accomplished on your own. Literally thousands of people may be involved in the making of a big-budget blockbuster. Even activities that we normally think of as solo endeavors will usually involve the contributions of several individuals. Take writing a book, for example. We often picture an author working by themselves, typing away each day to craft their story. But while the author may come up with the story idea on their own, getting it to publication requires collaboration. There are beta readers and editors who offer important feedback, agents who pitch the book to publishers and of course, the many people who bring that book to life at the publishing company. If something as individual as writing a book is actually a team effort, then surely fine-tuning your company’s web design should also be a collaborative process. While not everyone will be involved in the actual programming of the site, collaboration can help you avoid costly mistakes and create a stronger, more customer-friendly experience. There are more opportunities for widespread learning. To get some additional insight on how collaboration can spur more creative and effective web design, I reached out to Meredith Cooper, director of product marketing for Adobe’s Creative Cloud Enterprise. Her company has recently begun hosting what it terms “Creative Jams” – events featuring expert speakers and team competitions that fuel a collaborative, learning-oriented mindset. “Designers are hungry to learn. They’re hungry to experiment and try to push the boundaries and innovate, and we provide this through a new and different forum for learning,” she explains. The competitive nature of the events has served as a powerful transformative tool, as designers of different backgrounds and talent levels are forced to work together. This creates an environment where everyone learns from each other as they adapt to new tools and processes. Such collaborative experiences have been found to significantly improve results in the workplace. A 2014 study from Stanford found that collaboration improves engagement and the ability to stick to a task while simultaneously reducing fatigue and emotional burnout. In the fast-paced world of web design, with rapid project turnarounds and other pressures, such benefits can create a huge difference in overall productivity and the quality of design results. As Cooper further elaborates, participation in collaborative learning events such as the Creative Jam helps web designers develop new skills and gain valuable experience that will help them with future projects. Even an experienced web designer can learn from up-and-coming programmers who have experience with new technology and design principles. As all parties share information and insights, it becomes easier to identify best practices and important trends. You don’t have to be a designer to make this happen. It’s only natural that collaborating with other web designers would expose you to new tools and concepts that would allow you to better your work. But collaborative web design efforts shouldn’t be limited to the “experts” who know how programming works. After all, web design is ultimately meant to create a seamless end user experience — and the average person visiting a company’s website won’t have a design background. They just want a streamlined, easy-to-use platform. What works in one industry won’t always work in another. Because of this, web designers need to be willing to collaborate with “outsiders” to ensure the creation of a strong design that actually accomplishes the company’s goals. This requires industry research, customer insights and general design preferences — information that the non-design team will provide to help guide the design team’s work. Technically, even A/B testing is a type of collaboration – and an especially crucial one in the web design process. By learning directly from end users regarding which design choices impact bounce rate, conversion rates and other factors that will directly affect the long-term success of the website, designers can discover overlooked errors or make minor changes that lead to a big shift in results. The benefits of collaboration go beyond web design. It can also improve creative output on a company-wide scale. 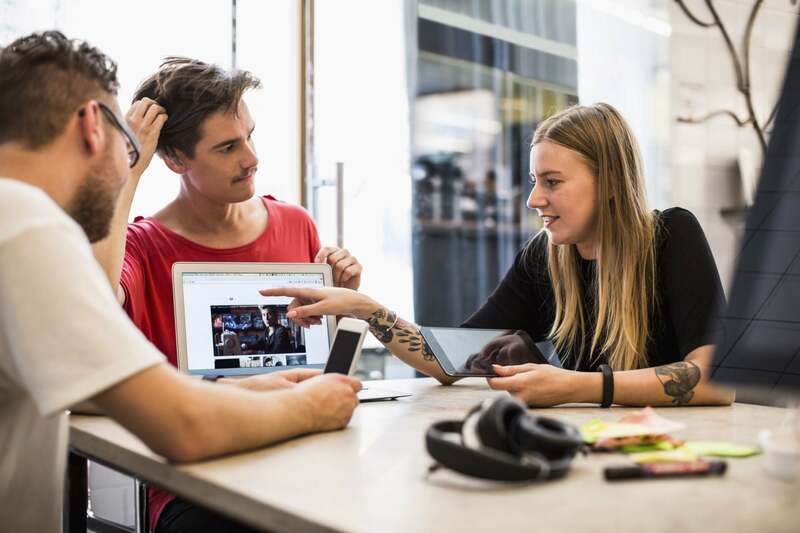 Sergio Castro, VP and group director of Digital Studio at Digitas, whose company participated in one of the Adobe Creative Jam events, found that collaboration helped transform everyone’s perspectives on idea generation. As employees gain outside perspectives from their collaborative efforts, they become more likely to think outside the box when confronted with new challenges or projects. Rather than falling back on the set, standard routine, they feel motivated to come up with better solutions based on the things they learned from their coworkers – something that 82 percent of executives believe will give them a competitive edge. Yes, collaboration will improve web design. But it also fosters a collaborative, innovative culture that creates a more unified and productive team – something that will deliver better results across all aspects of the business. Companies should clearly find the right balance when determining how many people will be involved in this collaborative process, as well as who should participate. While too many collaborators could actually slow down the work, the right mix of people will spur creativity and generate better results. When done right, quality web design can drive sales for your company and improve the overall perception of your brand. By incorporating insights from a wide range of individuals, including non-design team members and prospective customers, you’ll be better positioned to create a usable, innovative interface that helps your company stand out.